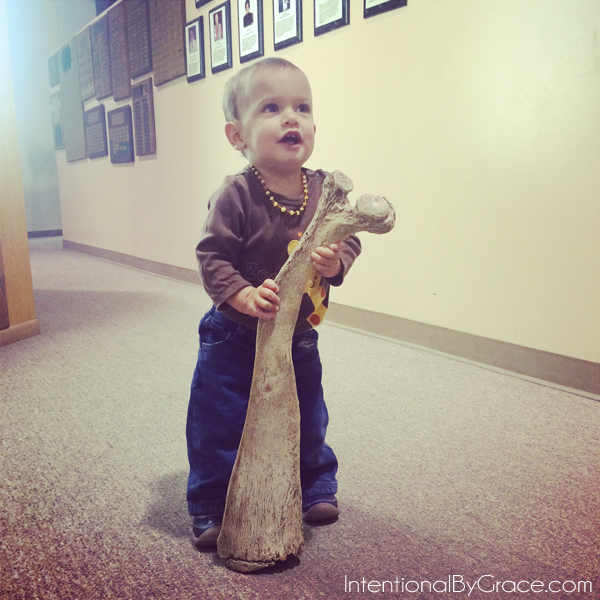 I took a little break over the holidays from sharing about our big family road trip we took in October. 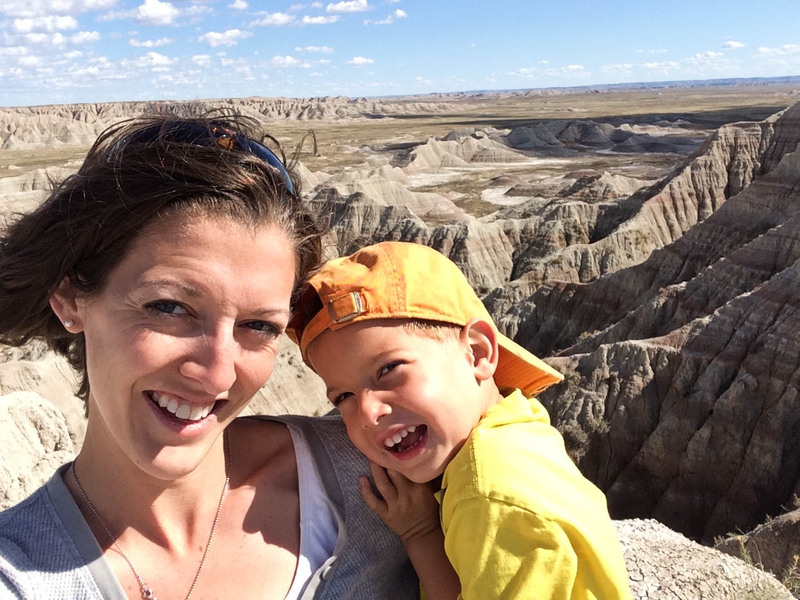 But I want to pick back up and share some of what we did in each place we visited as well as tips and tricks for road tripping as a family. 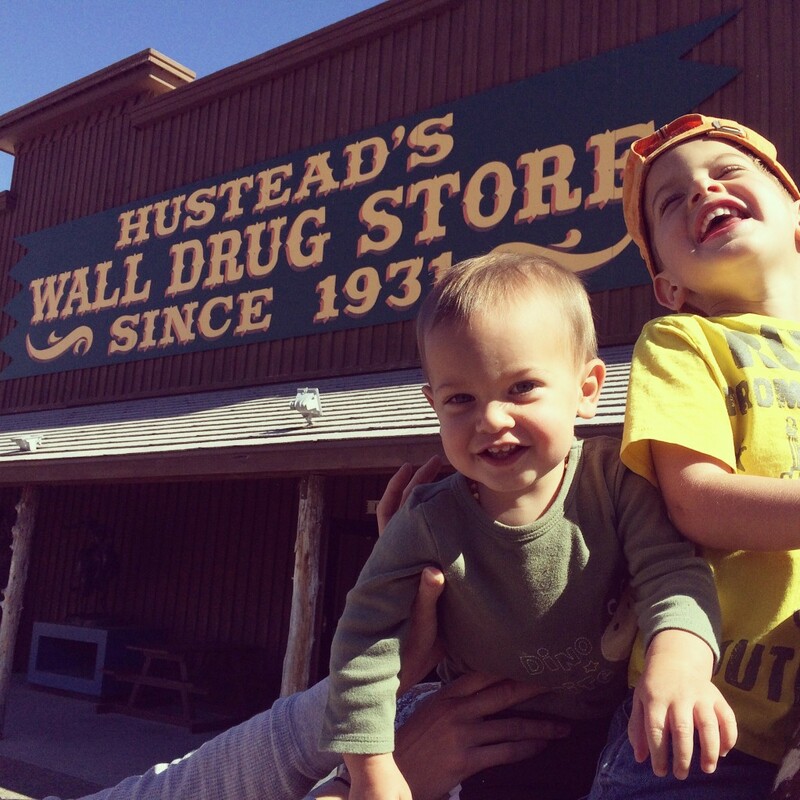 After Wyoming, we hit South Dakota on our family road trip. 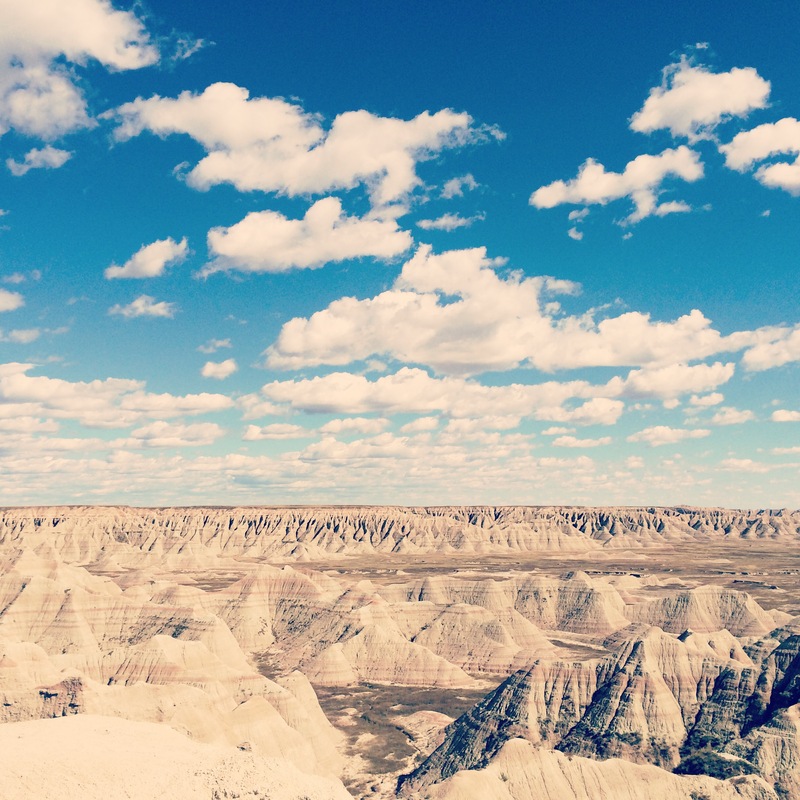 Can I just say that South Dakota is simply breathtaking? 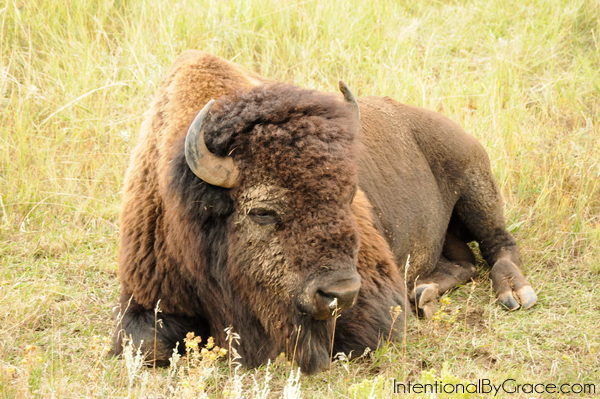 The landscape is gorgeous and the wild life sightings were plentiful. It was everything we hoped for and far exceeded our expectations. Even so, when we finally made it across this enormous state, we were ready to say goodbye. We started feeling a little alone as we drove across this very long state. We aren’t used to not being in overly populated areas. 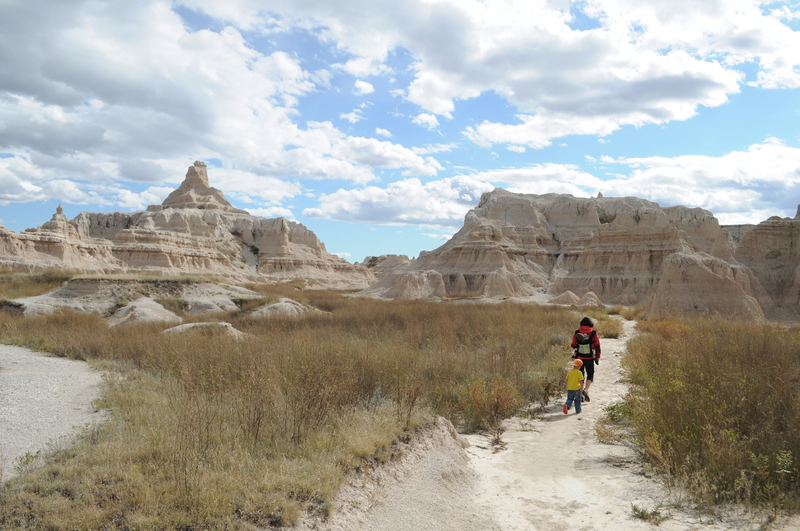 But South Dakota is a great place to visit, especially the western portion! Plus there are loads of things to do with kids! We stayed in a log cabin in Hot Springs, SD the first night of our visit. It was quaint and just what we needed. The owners were Christians and they proclaim the name of Jesus year round by leaving their Christmas lights up 365 days of the year. We found that interesting and neat. 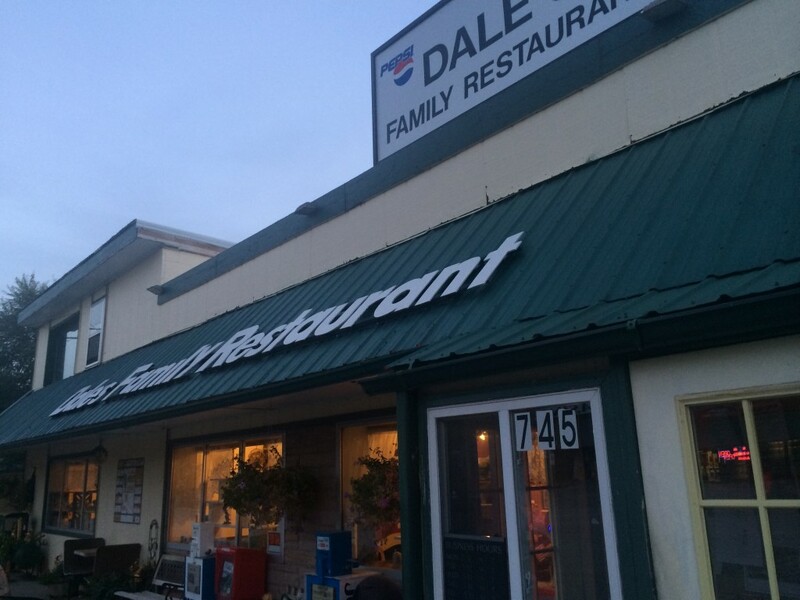 We ate dinner and breakfast at Dale’s Family Restaurant, a local diner. We got into town when the restaurant was closing, but they still fed us with a smile. They were so nice to us, we decided to go back the next day. The food was good and the people the friendliest I’ve been around in a long time. 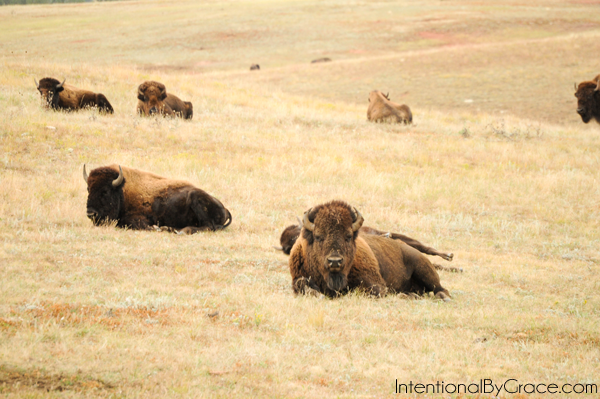 Hot Springs, SD is a sleepy town with a slow pace of life. A far cry from a ski resort town. It was wonderful. 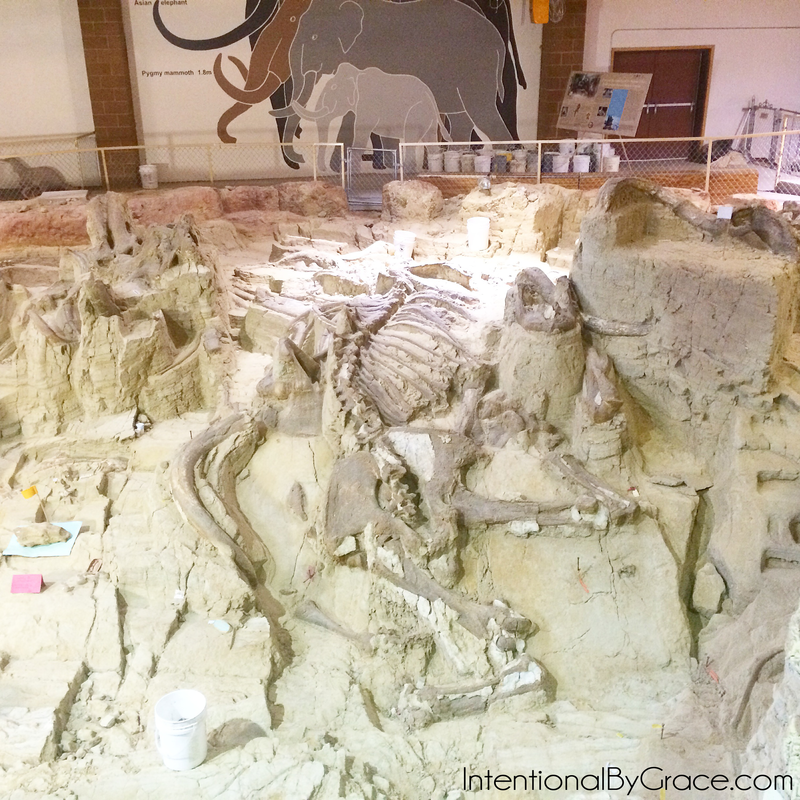 We made our way first to The Mammoth Site, which is an active paleontological dig site, boasting the largest concentration of mammoth remains in the world! 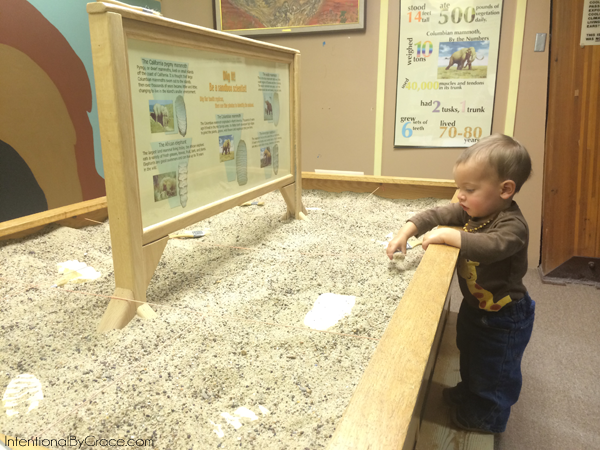 Their current mammoth count is 61, with 58 Columbian and 3 woolly mammoths. The only words I have for this place is: amazing. Absolutely amazing! To stand and walk through thousands of years of history. To imagine what life was like then was simply unbelievable. Wooly Mammoths are smaller than I imagined them to be, but the Colombian Mammoth was enormous. It was possibly bigger than I imagined. Sam and Timmy both really enjoyed this stop. 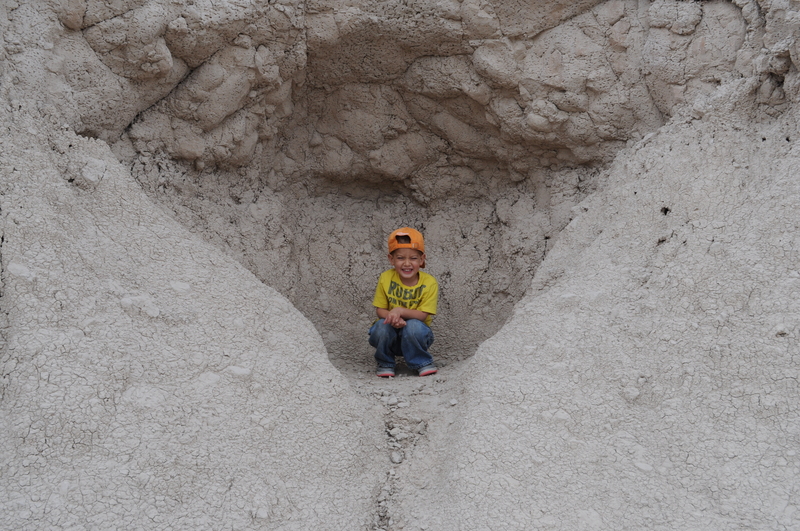 There was plenty to do, and I definitely want to go back in the summer to let the children dig! Heck, I want to dig too! Before we left, we picked up a Prehistoric Life Toob set for super cheap. Samuel loves anything miniature, and it was a great set to add to our busy bags for the car. The boys love them! 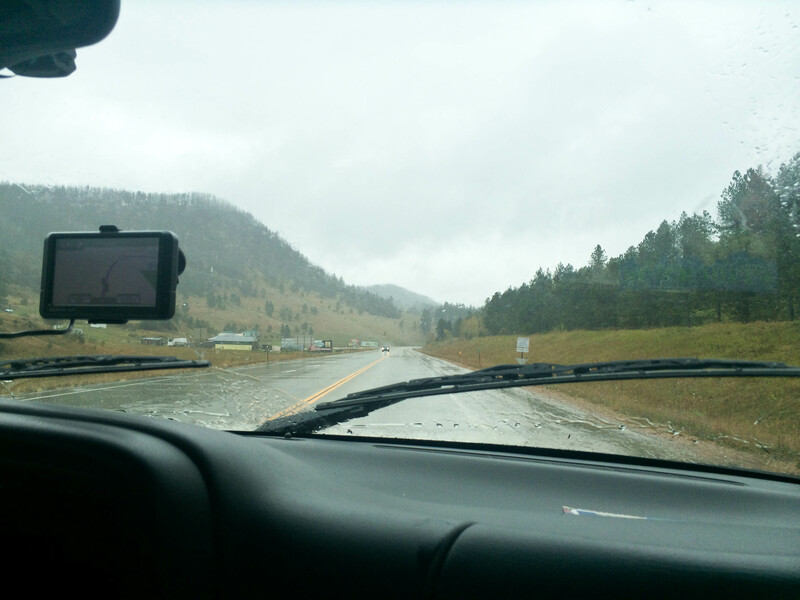 Next we drove the short hour or so drive to Custer, SD. We continued to take in the breathtaking views along the way. 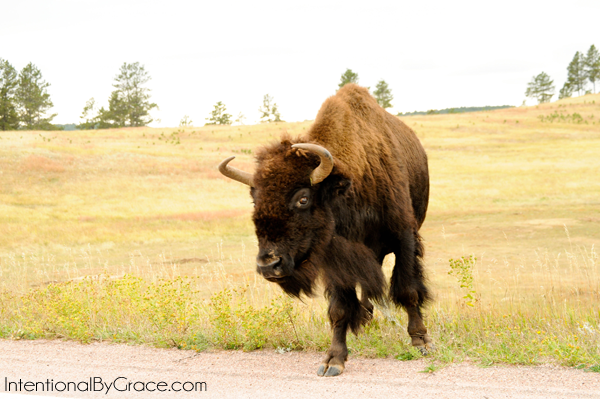 We came upon roaming bison along the by-way. Hundreds of them as far as the eye could see. We pulled over to get a better look and take pictures. They were just walking across the road, so close we could have touched them it seemed. Not that we even considered trying. The day turned out rainy and cold so we didn’t get to hike Harney Peak like we had planned. We were disappointed. So, we ate a picnic in the car on the side of the road while we decided what to do next. Mark suggested we just head on to Mount Rushmore and I agreed. This area isn’t much for indoor fun. Especially when you’re on a low budget. I was afraid Mount Rushmore would be hard to see or disappointing because of the rain and clouds. My fears were totally unfounded. Mount Rushmore was amazing, breathtaking, unbelievable. I spotted it first as we drove around the mountain, and I quickly pointed it out to Samuel. As his eyes recognized what we had spent weeks talking about and reading about, his face lit up. I think he was in awe and giddy excited. 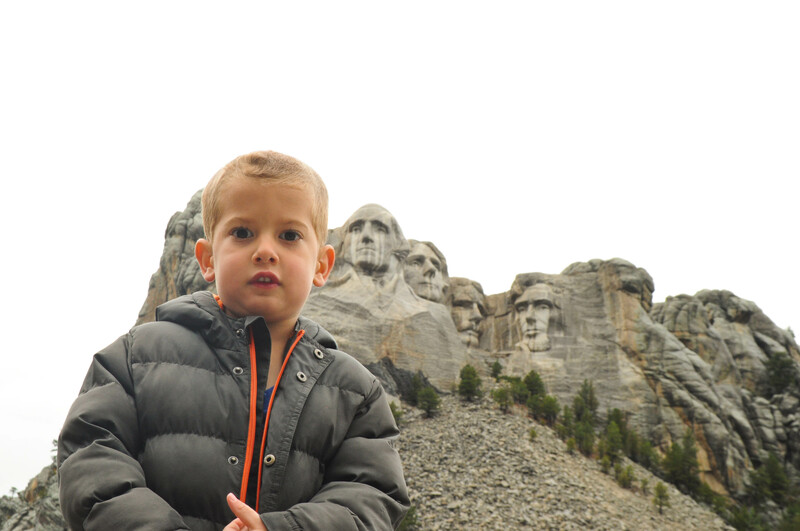 He had just woken up from a nap so he was pleasantly surprised that we were already at Mount Rushmore. We had a lot of fun conversations with Sam. 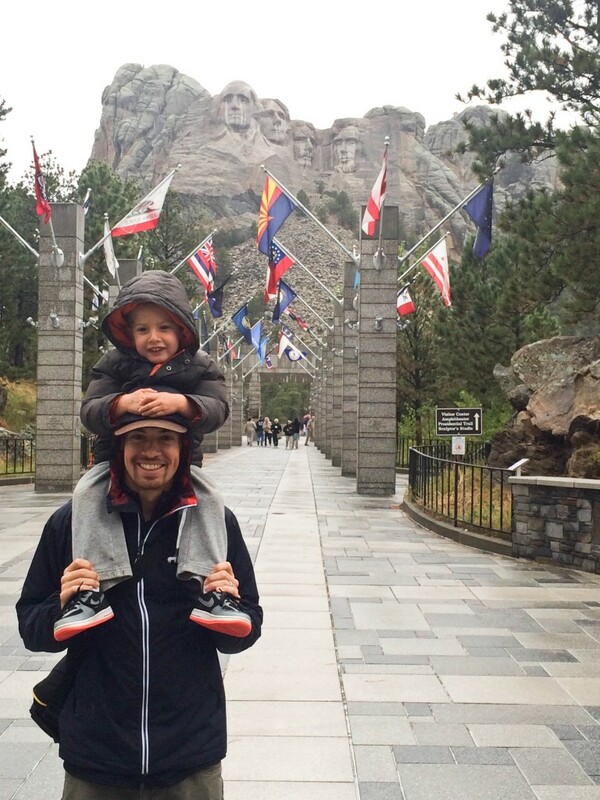 We’d been reading a lot of books about Mount Rushmore and the Presidents before traveling. When we got closer to the mountain, Sam started looking a little concerned. When I asked him about it, he said, “I don’t want George Washington’s teeth to fall out on me.” Ah, I love childhood innocence! 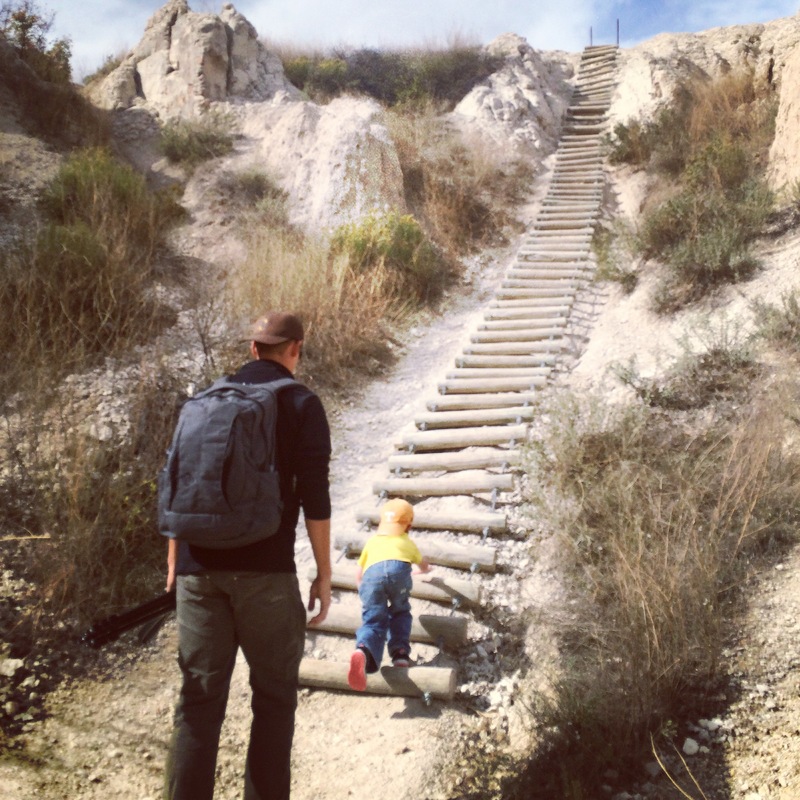 By the way, if you want a fun way to introduce your children to Mount Rushmore before visiting, I highly suggest Run for the Hills, Geronimo! We read a lot of Geronimo Stilton books before our trip, and it was totally worth it. The walk up was cold and drizzly. We put Timmy on my back in the Boba. We all had lots of layers and rain jackets on. Yet even though it was cold and wet, everyone was happy. We walked quickly to the information center to get inside to warm up. We checked out the large map to get a feel for the land, and then quickly marched up the walkway to the viewing site. The flag walk was really cool. It felt so patriotic, and I couldn’t help but breathe a prayer of thanks that I get to live in America. With all of its faults and failures, it really is a privilege to live in the land of the free and home of the brave. The rain continued to drizzle, but we headed to the museum anyway. As we walked around inside, I kept glancing back out the window at George Washington, Thomas Jefferson, Teddy Roosevelt, and Abe Lincoln. I couldn’t keep my eyes from them for long. We watched a short video about the carving of Mount Rushmore together as a family. Timmy wondered up and down the aisles while the rest of us listened intently. When it was over, I asked Sam, “How did they make Mount Rushmore?” His answer, “BIG!” Accurate, but not what I was going for. I was hoping for something more along the lines of dynamite, hammers, etc. Maybe next time. Ha! Soon the rain cleared and we went back outside. Someone from Jersey took our picture as a family. 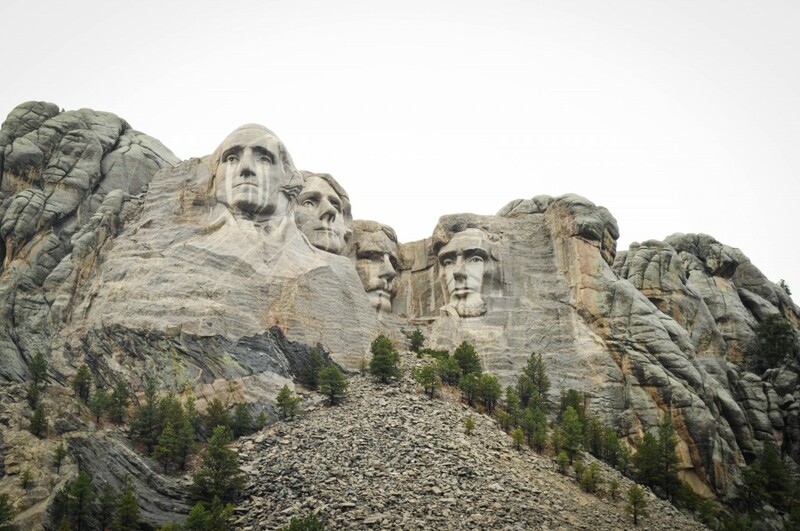 Then, we opted to take the Presidential Hike to get a better look at the Presidents. I’m so glad we did. 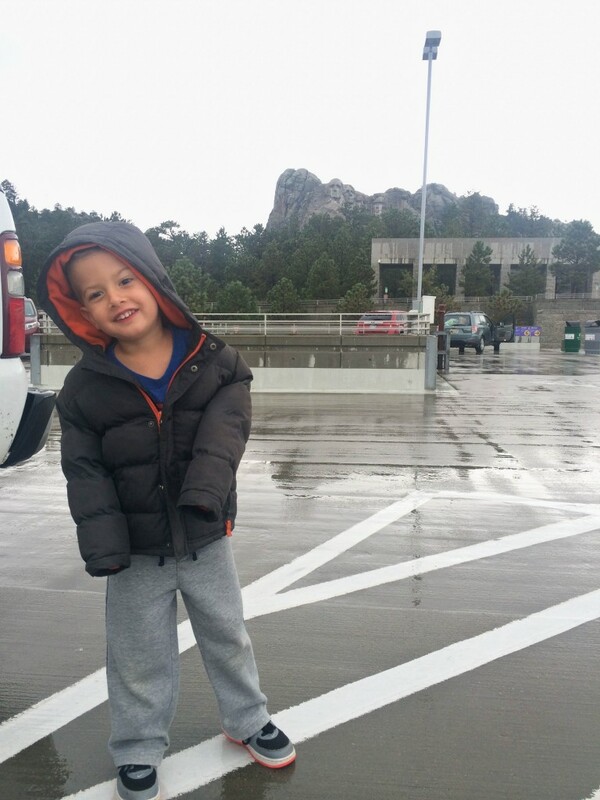 We were able to get even closer and view Mount Rushmore from several different angles. It was truly incredible. Absolutely incredible. 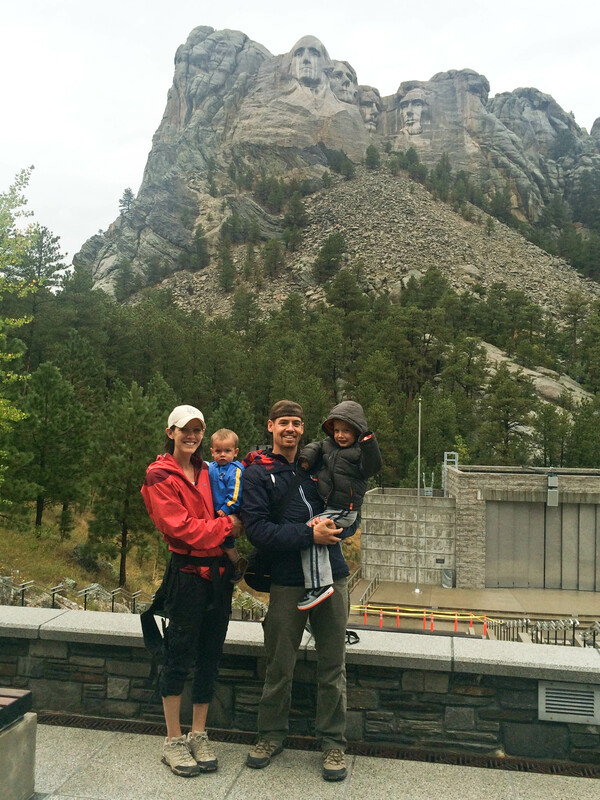 We left Mount Rushmore and headed to Rapid City to find a place to stay for the night. 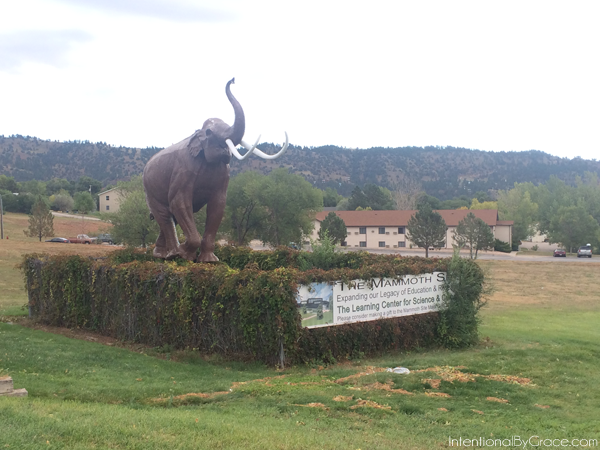 As soon as we came over the pass and saw Rapid City we were startled by the quick change of landscape. You could see as far as your eye could see. No more mountains blocking your view. No more wondering what’s around the corner. The whole town sprawled out before us. It was awesome. We found a hotel on Hotwire for super cheap. A local hotel, not a chain. It was perfect and cozy. We ate at Texas Roadhouse. It’s been years since we ate at one. Living in a resort town that doesn’t allow chain restaurants meant we had to eat at a chain just once on this trip. Tonight seemed like the perfect opportunity. After dinner, we took the kids down to the indoor pool. It even had a slide! 131 feet to be exact. I even road the darn thing. Be a “yes, mom” Mark said. So I went first. We had a blast! We didn’t last long because the boys were shivering so profusely, especially Timmy. We had the pool to ourselves though and it was so fun. The next day we realized that not much was going according to plan. 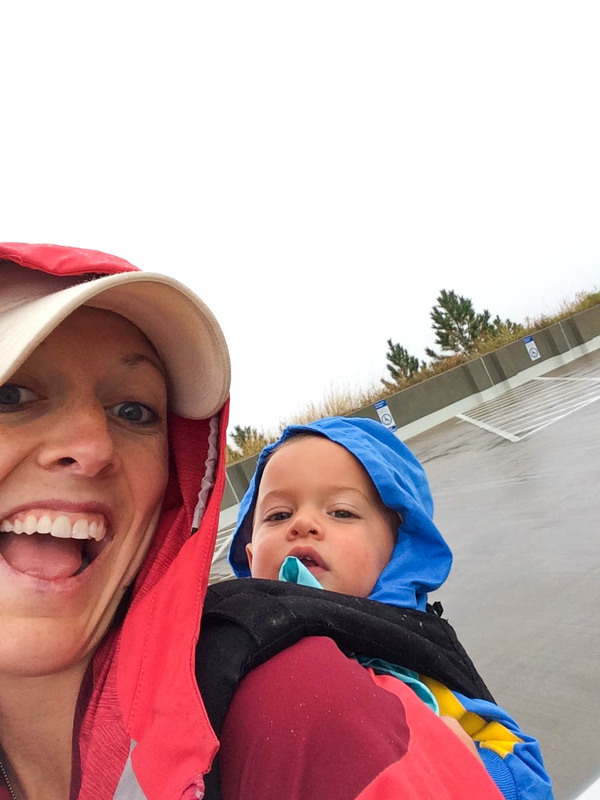 A cold front raged across the country, interrupting much of our outdoor plans. Yet we were having the time of our lives and enjoying the journey. We hit the road a little late on the day we were scheduled to hike Notch Trail. Then, we were sucked in by the signs to stop at Wall Drug. 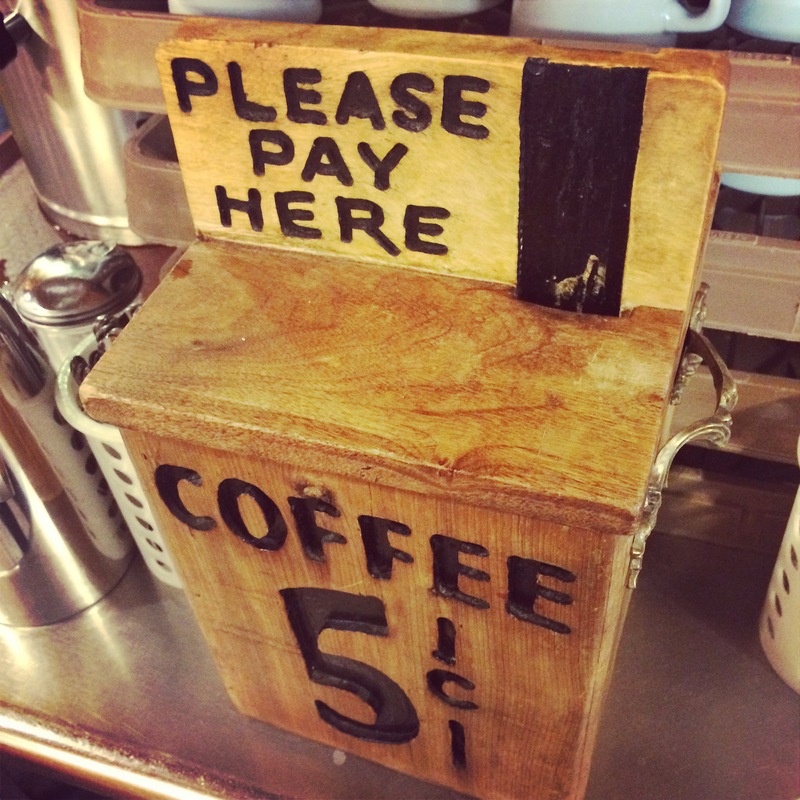 The $.05 coffee signs sold us. 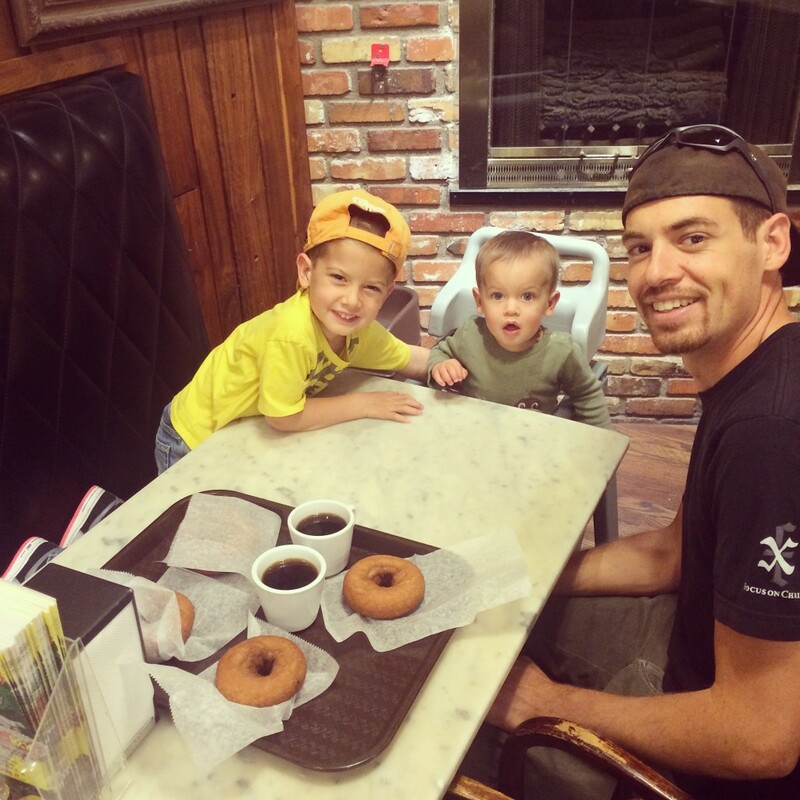 We enjoyed cheap, but delicious, coffee and cake donuts together while reading about the history of Wall Drug. It was a great stop off for the kids to get their wiggles out and just enjoy something touristy. 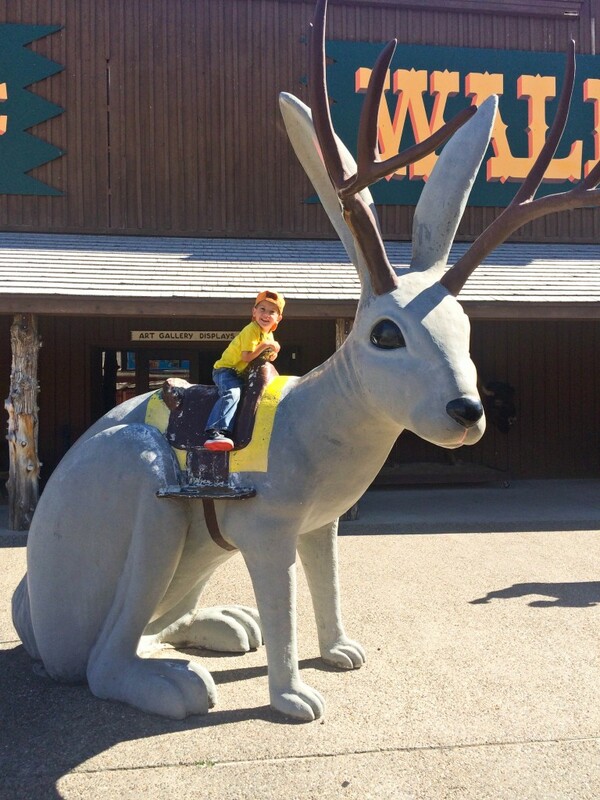 And what kid wouldn’t want to sit on an enormous rabbit? 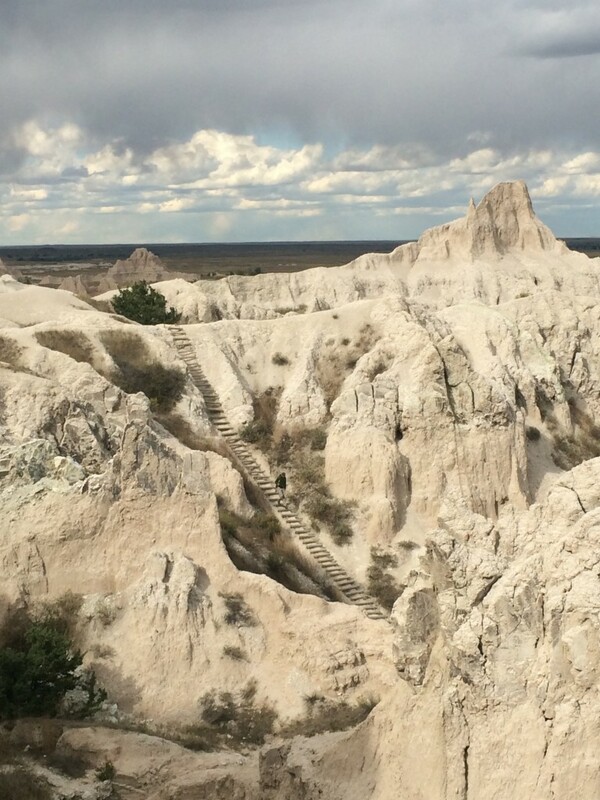 The Badlands were incredible. Nothing can prepare you for what you will see. Of course, we recognized them from pictures, but the vast magnificence of the rugged terrain is breath taking. As the wind threatened to lift us off our feet and toss us off the cliffs, we took in the view with wondrous awe. Sam was holding on for dear life! We hiked Notch Trail, which was absolutely incredible! 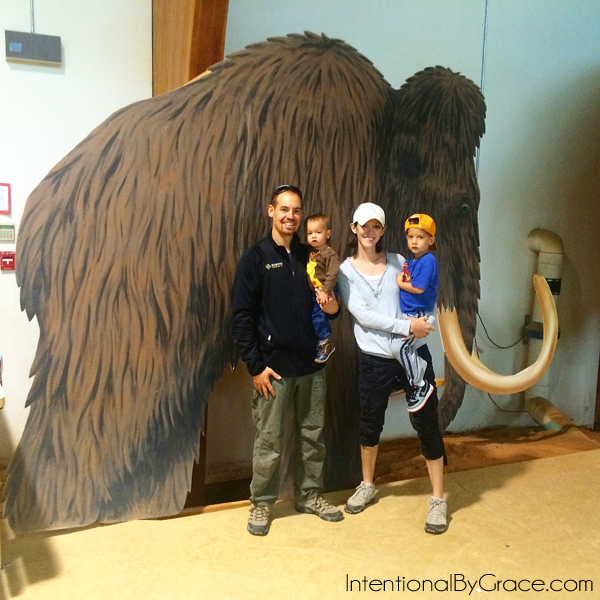 We were a little worried about taking the kids, but we decided we could always turn back if we didn’t feel safe. Samuel scaled the ladder like it was a backyard playground. He was brave and proud. Going up the ladder wasn’t nearly as difficult or treacherous as coming down. I hiked the trail with Timmy on my back. The hike was spectacular and the views along the way incredible, but the view at the end was a little disappointing. The pull off at the start of the park was far more breathtaking, but the hike itself was worth it all. It felt good to hike after a few days in the car, and the kids just loved it! 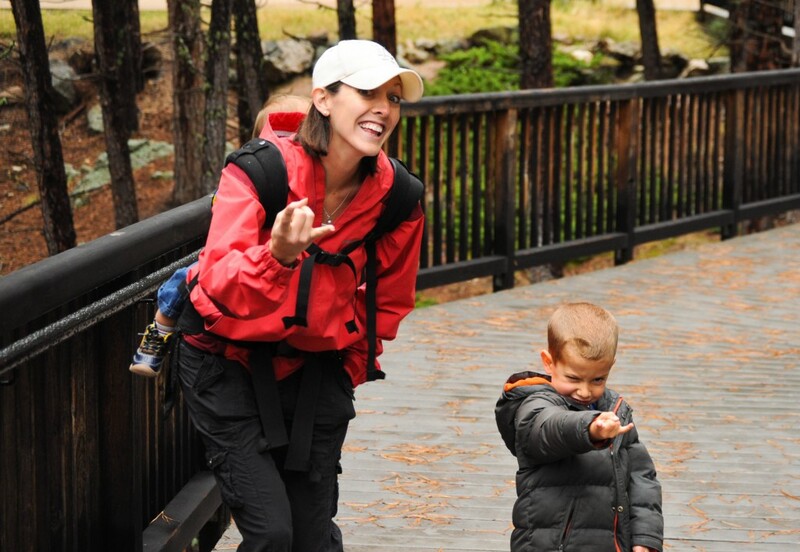 We’ve hiked with the children several times so we were totally fine hiking Notch Trail. 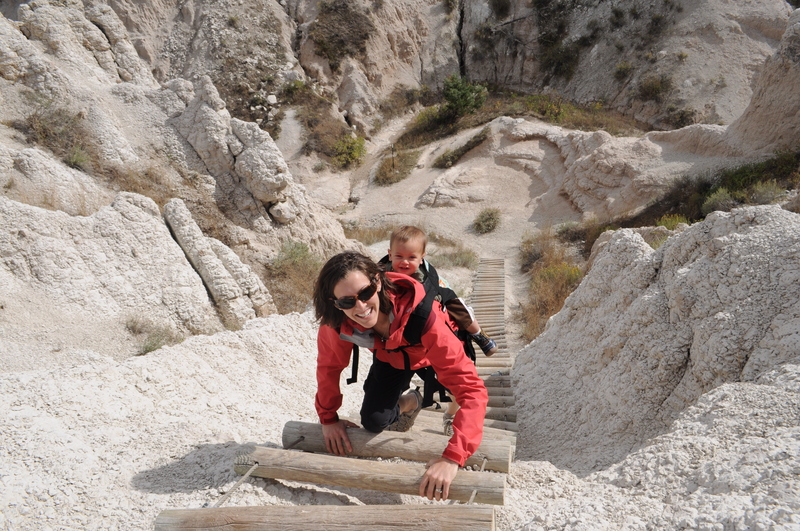 It’s a moderately difficult hike with little children who need a lot of help, but for us it was worth it. Coming down the ladder was a little scary, but just take it easy and slow. We wanted to get as far as Sioux Falls on this day, but it didn’t happen. 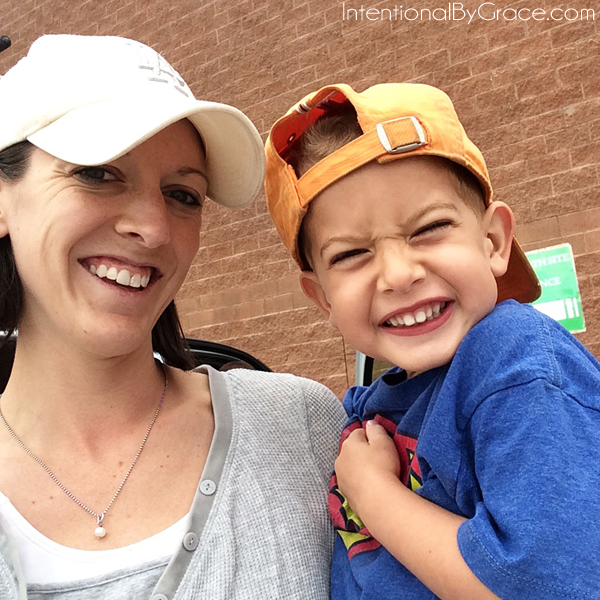 We were exhausted and the weather really dampened our plans for Pipestone and Pikes Peak, which we thought would be so fun with the boys! We were really disappointed, but we headed to Pierre, SD instead and called it a day. The next morning was windy and cold. 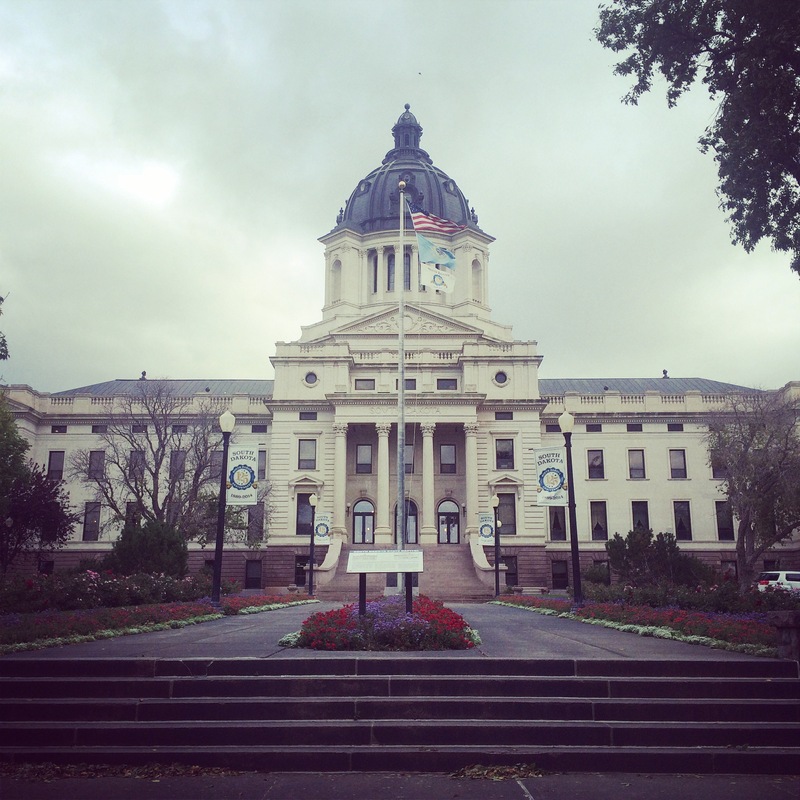 We drove by the capitol building in Pierre, which was really spectacular. The Greek architecture was beautiful, but we decided to head on out of town since we knew it would be a long day on the road instead of going in for a tour. 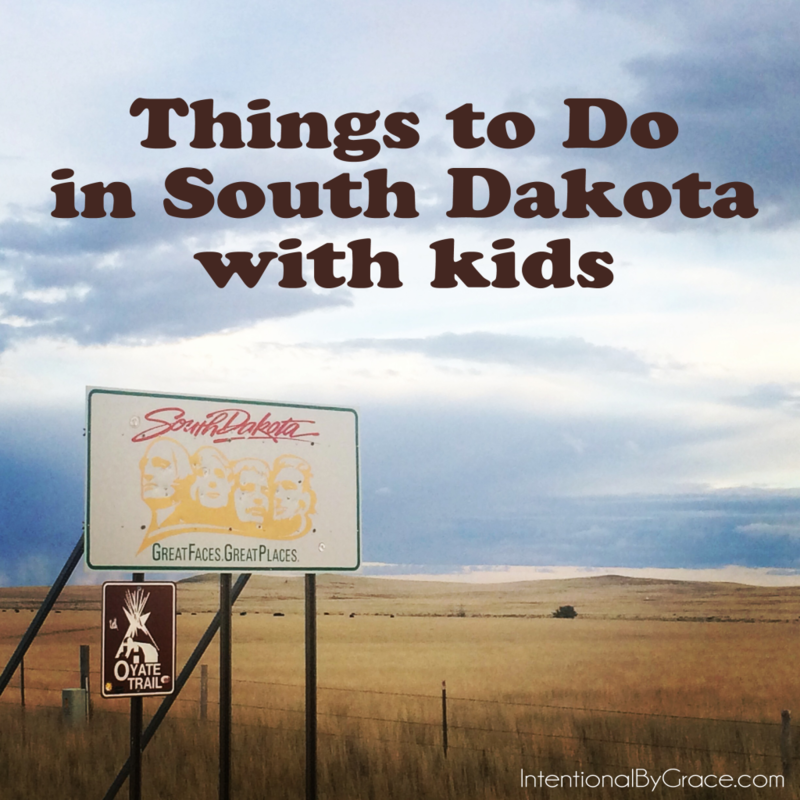 We headed for De Smet, SD where Laura Ingalls Wilder grew up. We hoped to tour the homestead and see the sites. But yet again, the weather really dampened our plans. It was too cold for a foot tour of the town, and we timed it wrong. 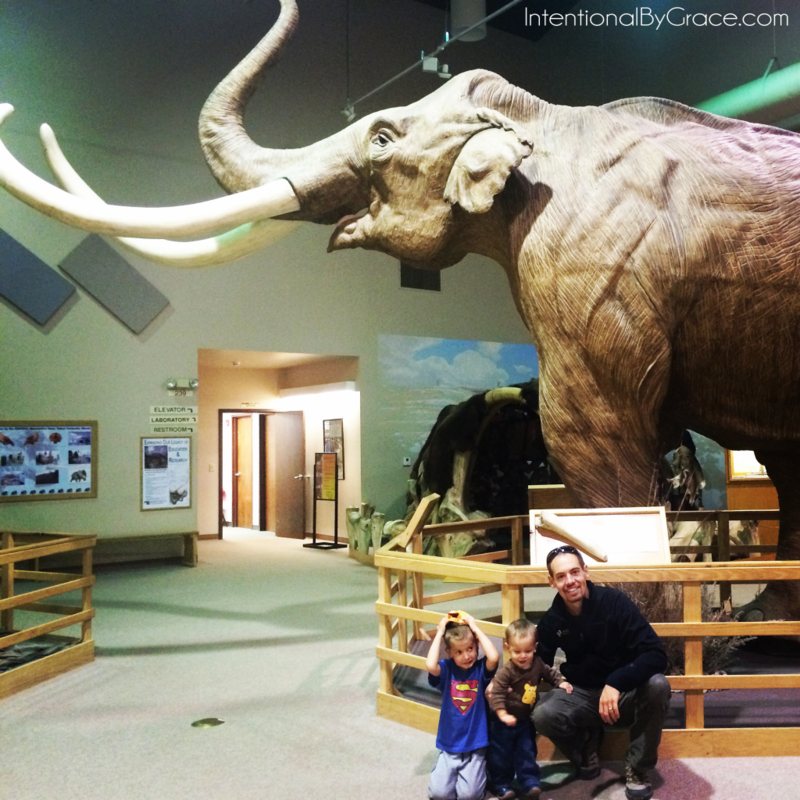 The snow pushed us out of town and we headed for Des Moines, IA. Overall South Dakota was amazing! 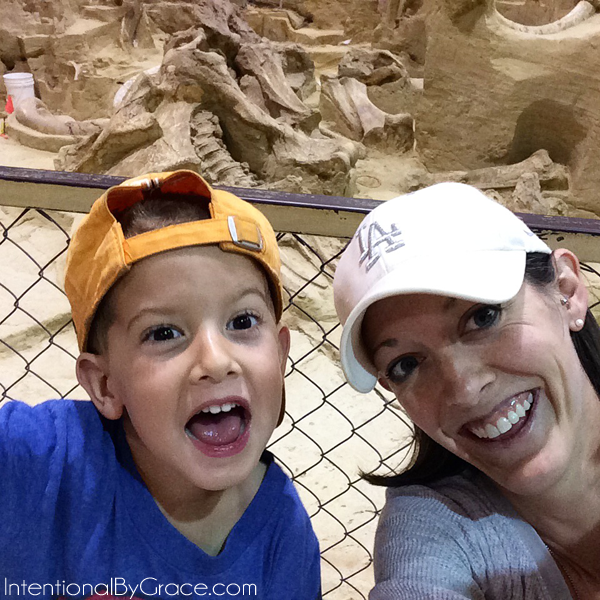 The weather really blew our plans for a lot of fun destinations, but we made the most of it. We kept telling ourselves that this won’t be the last time we travel. Travel is in our DNA so whatever we don’t get to enjoy thoroughly this time, we’ll hit some other time. It just gives us a reason to keep traveling, right? But as you can see there are loads of fun things to do with kids in South Dakota. I think the one note of caution is that in between destinations, there is NOTHING! Not a bathroom, not a gas station, not anything. Just miles and miles of flat, beautiful land. I would keep this in mind as you travel across this amazing state and pack snacks, drinks, and just go ahead and bring along a portable potty for the kids. 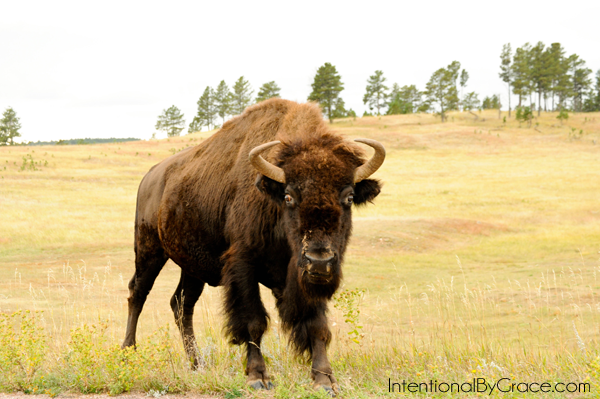 Have you ever been to South Dakota? What would you suggest we hit up next time?